Preview Jude’s Soundscape Score with Glenna in action! Human Origami is a guided improvisational process that explores folding through movement and sound. Folding is how we got here, the personal and collective biological archive that threads throughout our lives. Glenna and Jude invite all movers to join in an immersive environment – a meeting of matter and mind, memory and meaning. Here, the parentheses around habitual movement vocabulary can drop away, opening doors to deeper layers of embodiment. From the source of a movement impulse comes to new forms and pathways. Come revisit your body’s fluid template as it emerges in the creative moment – each moment momentous. Glenna Batson created Human Origami as an artistic, somatic and scientific investigation into transformational consciousness. The process offers a means of moving away from default patterns of movement training and cultural imprinting, affording deeper access to creativity within your DNA. Since 2013, Human Origami has hosted a number of events, including improvisational jams, movement rituals, focused choreographic research, art installations, fashion shows and conference presentations. In December of 2017, the Hong Kong Academy of Performing Arts hosted a symposium called Practice as Research. The three-day symposium was designed to highlight pioneering practices in dance practice and performance. The poster outlined the history of our collaborative work in creating an improvisational movement form called Human Origami, based on the macro- and micro- explorations of bodily folding. We designed the poster as interactive. The first exercise asked the viewer to take a piece of paper and create only ONE fold – anyway they wanted. Then, observe what you made, write your image on a piece of paper. The second exercise, asked the viewer to recall the earliest fold in their life, and taking a piece of paper, re-create the fold from their imagination. They were then asked Where does this fold still reside in your body? How does it still operate in your life? The viewers could put both their comments from exercise one and two into little constructed origami boxes on the table. Twenty-first century dance has benefited from the exponential growth of embodiment studies. Dancers now readily engage in trans-disciplinary and culturally inclusive studies worldwide. This workshop introduces participants to a movement practice inspired by phenomenology, somaesthetics and bio-science. 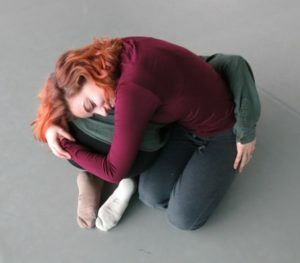 The practice, called Human Origami (HO), an exploration of patterns of body folding. HO is designed to transform consciousness and enhance movement potential. The practice is improvisational, an interplay of movement and multimedia – photography/film, sound, and paper. The concept derived from phenomenologist Gilles Deleuze’s book, The Fold (1993), a metaphysical treatise on Baroque aesthetics. For Deleuze, the fold is a metaphor for human potential, continuous and infinite. HO evolved over a three-year intermittent collaboration between two dance educators from different dance- and somatic traditions, who piloted the work in the UK, USA and Asia. Aiming to view performative training through a somatic lens, they created a sensory-rich immersive movement lab where dancers challenged choreographic thinking and deepened performative skills. The somatic process gave rise to an embodied ontology of becoming whose unfixed boundaries were iterative, non-linear, and liminal. Reflection/discussion gave rise to new narratives, and also revealed commonalities between bio-science and embodiment theory. In this presentation, participants will sample HO. The presenter will summarise key findings from the project and lead participants through a movement experience. Discussion will touch upon the value of HO in shaping performance practice within multicultural contexts. Deleuze, G. (1993), The Fold: Leibnitz and the Baroque. University of Minnesota Press.